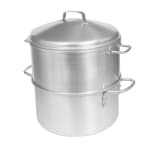 Cook rice and vegetables the healthy way with this Wear-Ever® 5-quart aluminum rice / vegetable steamer from Vollrath. Featuring a lightweight aluminum construction, this 5-quart rice steamer / cooker includes a base. The steaming holes in this rice / vegetable steamer measure 3/32-inches, which allow for the ideal amount of steam flow to cook your food, while still being small enough to hold in small grains of rice. "I have always been using this product to cook my rice and the result has been great. I have no cons on this product." "When I unpacked it I was taken aback by its thin walls. I washed it in the dishwasher before using it and it immediately tarnished to an uneven a..."
"Perfect for steaming rice evenly. Holes aren't too big for rice to go through." I would always buy this product because it's good. "When I unpacked it I was taken aback by its thin walls. I washed it in the dishwasher before using it and it immediately tarnished to an uneven and unsightly dark gray. Sorry I bought it."